Restaurant Victorio is located 300 meters away from the Hotel of Sveti Vlas, on 2, “Morska” St., in the complex of the same name “Victorio”- 2. All hotel guests use a constant discount of 10% on the menu. Victorio Restaurant offers abundance of seafood and selected meat dishes. Enjoy the diverse menu in a stylish atmosphere, surrounded by greenery and tranquility. We have also taken care of our young visitors, who can paint on our boat, while mom and dad are taking rest in the garden of the restaurant. Daily, from 08:00 to 00:00 o`clock. 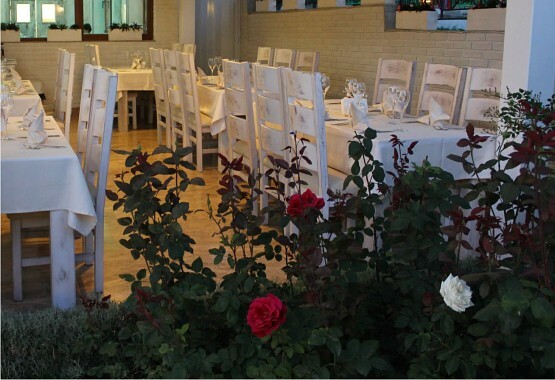 In Restaurant Victorio in the town of Sveti Vlas you may order breakfast, Greek, Mediterranean or Italian cuisine, pizzas, sea-food, soul food or vegetarian cuisine. The specialties of Restaurant Viktorio are beefsteak by a special recipe and vegetarian cuisine.